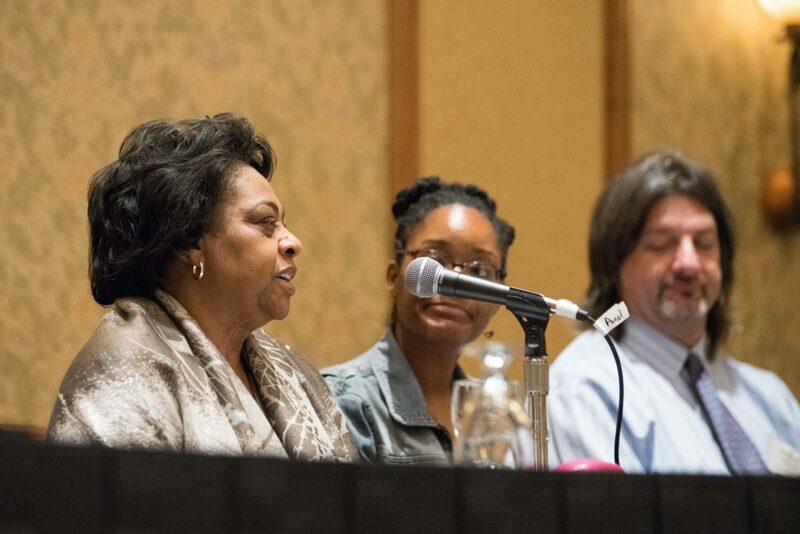 Plenary panel addressed a captive audience at the Racial Equity Challenges in Agricultural Land Tenure. Shirley Sherrod, Southwest Georgia Project, among the panelists. 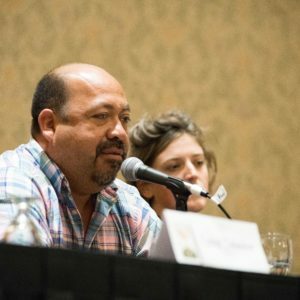 Javier Zamora, owner and operator of JSM Organics (CA), took the stage with other young and beginning farmers to share their inspiring stories. Andy Sorrell, Virginia Department of Agriculture, took a deep look into farm link programs at an engaging roundtable discussion. Monica Rainge, Federation of Southern Cooperatives, spoke to a full house at the Addressing Systemic Prejudice workshop. Changing Lands, Changing Hands was a national conference on farm and ranch access, tenure and transfer held in Denver CO in June 2017. Learn more about the conference or access the conference program booklet that includes session descriptions, and presenter bios and contact information. Over 80 speakers addressed topics in five tracks. And over 200 practitioners, farmers, service providers, policy makers, researchers, academics and advocates shared their knowledge, experiences, challenges and accomplishments across a broad range of topics and issues. This conference report catalogs many of the successful practices, innovative programs and policy suggestions that were shared at the conference. It is not a comprehensive compendium on the issues, or a list of all the resources on these topics. Nor is it an endorsement of any particular program or organization. Click on the track titles to review sessions, workshop notes, selected presentation slides and the practices, programs and policies from that track. 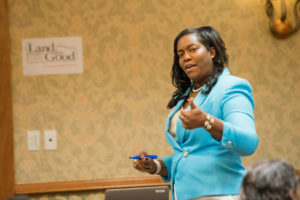 Each track included two types of workshop formats and a roundtable session. In the presentation format, speakers presented about their organization, project, or work, often accompanied by slides. In the discussion format, discussants offered observations (without slides) about the topic to invite open discussion among session participants. The roundtable sessions allowed a more in-depth, facilitated exploration of a key challenge. Five plenary panels addressed farm and ranch access, tenure and transfer from various angles. On the final day, seven regional breakout sessions enabled participants to assess the state of affairs and set priorities for their geographic region and to lay the groundwork for future networking. Each group completed a facilitated process to identify successful programs, emerging practices and public policies that address land tenure issues. They assessed strengths and gaps, and brainstormed what could be done more or better, and identified some next steps. Conference consensus. The dialogue was rich, drawing out different perspectives and values regarding these complex issues. Nonetheless, there was wide agreement on several key points. Changing Lands, Changing Hands conference (June 2017) was hosted by Land For Good in cooperation with the U.S. Department of Agriculture. 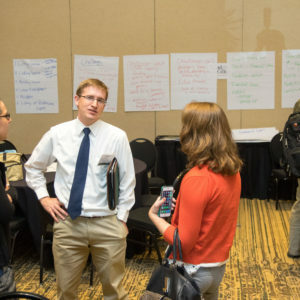 Thanks to conference sponsors: Farm Credit; Cedar Tree Foundation; Rocky Mountain Farmers Union; National Farmers Union, Farm Aid, International Farm Transition Network; USDA Sustainable Agriculture Research and Education; Drake University Law School and American Farmland Trust. Thanks to the Conference Planning Team, the Colorado Host Committee, session moderators and scribes, videographers and interviewees. Changing Lands, Changing Hands conference (June 2017) was an activity of Land For Good’s Land Access Project (LAP), Phase 2. LAP Phase 2 is funded by the USDA National Institute of Food and Agriculture through its Beginning Farmer and Rancher Development Program Grant # 2015-04544. LAP is directed by Land For Good in partnership with over 40 organizations, agencies and individual experts in six New England States and nationally. Access to land is a key challenge for American farmers and ranchers, and for the future of US agriculture. Land access and tenure require more programming, public policy and research attention. The complex and fraught history of US land tenure has shaped this challenge and must be addressed going forward. Farm and ranch succession are critical challenges, for all types and scales of operations. Farmers and ranchers need more assistance with succession planning. While land ownership is a fundamental American value and a goal for most producers, a range of tenure strategies is necessary and desirable. Agricultural landowners need to be reached and supported; connections between landowners and land seekers must be fostered. Regional characteristics and needs are distinct and require customized solutions. Diversity (ethnic, racial, gender, age, scale) is essential and should be promoted by practitioners, policymakers, and advocates to solve land tenure problems. Addressing the national challenges of land access, tenure and transfer will require public policy reforms, new policy tools, education, and broader application of innovative land access and transfer methods.